I haven’t liked every film Steven Soderbergh has released but I will always admit he is good at what he does. He is probably the most successful indie director working in Hollywood today. Somehow he still manages to bring that small crew sensibility to any film he’s working on. The huge amount of A-List talent he manages to pull in, even for bit parts, is a testament to how good a director he is. His latest foray is called ‘Contagion’ and that is pretty much the story in a nutshell. It is the only type of horror film that I could see Soderbergh making. A horror that is based all to close to reality with people in really horrible situations. I recall some interesting interviews when he remade ‘Solaris’ which was completely against his common directorial choices. He chose the movie because it wasn’t so much about the science fiction as it was about human nature. In the case of ‘Solaris’ it was human frailty in the face of devastation. 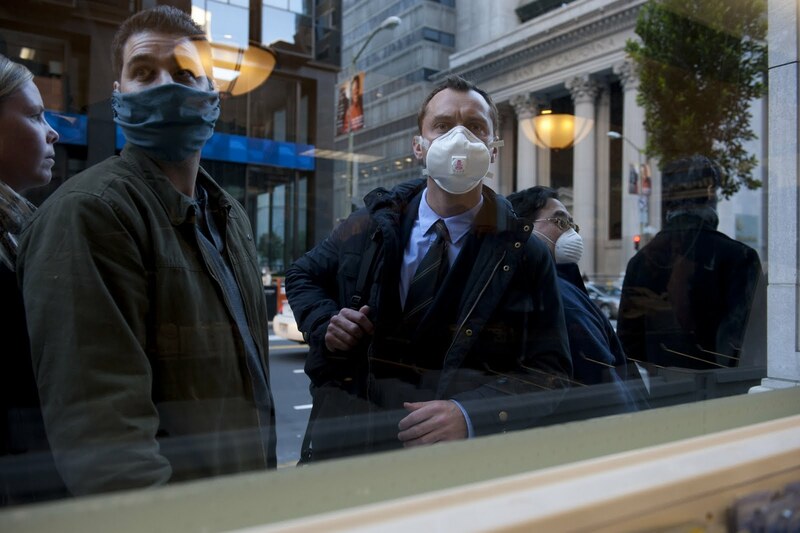 The same theme seems to run rampant in ‘Contagion’ but at a much larger scale. What happens to the world when an incurable disease hits the air? How do people react? How does it affect a government and the surrounding medical industry? One may recall that this film sounds like ‘Outbreak’. Soderbergh’s version takes it a step further and removes itself from many of the melodramatic mistakes its predecessor made, and I liked ‘Outbreak’. This film takes no mercy on its main characters and has no last minutes miracles to save their lives. People die without dramatic interludes. There is human drama but it focuses more on human reactions to how a deadly disease on a worldwide scale might affect people from various walks of life. Also how the medical industry might try to make a profit off of something so horrible. There is a very large cast of characters and we follow from all over the world. They hunt the disease, its host and the method from which it spread. While the film’s tagline calls itself an action thriller, there is no real action in the sense of Michael Bay. Its thrills manifest themselves in the way a disease could spread so easily in our modern society. Thanks to the unnerving soundtrack and a superb cast of actors, you may find yourself with many more bottles of Purell after watching this film.